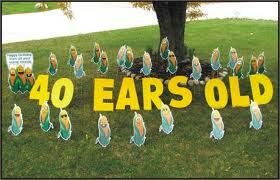 YARD GREETINGS :: CORN EARS - The Outhouse Party Store Online | Candy, Chocolate, Rentals, Holidays, and More! THIS YARD GREETING COMES COMPLETE WITH "EARS OLD" LETTERS, 24 FUNNY FACED EARS OF CORN, ONE LARGE CHARACTER THAT STATES "HAPPY BIRTHDAY FROM ALL YOUR CORNY FRIENDS". PERSONALIZE WITH AGE AND NAME AT NO ADDITIONAL COST! !